Amazing and very extensive review! 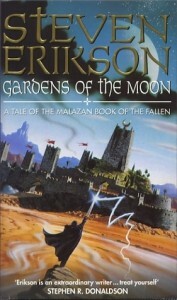 I read Gardens of the Moon a few months ago and I was really blown away by the epicness of the story! I liked it so much that I gave it 4.5 out of 5 in my goodreads review (see link above). I intended to read book 2 right away but life got in the way and unfortunately I haven’t done it yet. To be honest, I have kind of forgotten the whos and wheres… However, your review was an excellent recap for the main plot points and I will hopefully jump in the second book in the next few weeks. I wouldn’t worry too much about remembering the details before going into book 2 in the series, since it mostly involves a new cast and a different part of the world – although there are a few returning characters. If you liked Gardens of the Moon then I think you’ll really enjoy Deadhouse Gates, it and the third book Memories of Ice are the best in the series. That sounds really promising and I can’t wait to find the time to start reading DhG ! Also, not sure if I mentioned that before, I’ve been following your blog for some time and I really like your reviews! Well done! I just read your Goodreads review, I agree with your comment about one character’s love story not really working, writing romance doesn’t really seem to be Erikson’s strong point.